David Leshaw is the CEO of Finishers Club, a startup for runners. He hails originally from New York, and currently lives with his wife and their toddler in Jerusalem, Israel. He is passionate about trail running, good coffee, and tech startups. He one time got a double-bingo in Scrabble. Mike: David, what exactly is finishers.club and how does it work? David: Finishers Club is a free online platform for runners to log their race finish times and track their gear — think of it as a mix between a virtual marathon trophy case and locker for your running gear. It’s a fantastic way for runners of all distances to show off their running achievements with a dedicated running profile page, and to also let other runners know what kind of gear they use, and how they like it. We also have a weekly newsletter, as well as an iMessage sticker pack. Mike: You chose dot club for your domain. Tell me what went into your domain choice. David: Dot-club was a natural choice for us. We had originally chosen the name “Finishers Club” as a way to convey the exclusivity and sense of community engendered by crossing a finish line — no matter the distance. Whether you’ve hustled across a 5K finish line or dragged yourself through the last minutes of an ultra-marathon, you’ve become a member of a club — people who set a goal, who trained, and who followed through. We wanted to capture that spirit of achievement and camaraderie through our name, and “Club” seemed the natural way to do that. At the time, FinishersClub.com was taken, but .club fit better with our mission, regardless. Mike: What benefits have you seen from going with dot club as your tld? David: The medium is the message here, and our choice of .club as our TLD makes it clear that we are committed to conveying that sense of exclusivity and achievement produced by crossing a finish line. I also believe that, in general, shorter names are better, and since it takes fewer breaths to say – or keyboard strokes to type – “finishers.club,” the name’s relative brevity works to our advantage. Say it out loud: “finishers-dot-club.” It’s simple, almost impossible to misspell, and the “clubbiness” of the TLD provokes curiosity in people who haven’t yet signed up. Mike: How long have you been in business and how many users do you currently have? David: We’ve been in business just about one year, and have several thousand users across the globe. Our member base ranges from busy parents and college students who run 5Ks on the weekends through sponsored ultra-marathon runners who tackle 100-mile races in a stretch, and everyone in between. Mike: How does a site like finishers.club generate revenue? David: We’ve just launched our tee shirt store, where race finishers can customize a performance race tee that features a bib imprinted with their name, their favorite race, and their finish time at that race. We also sell various other fun tee shirts and trail running caps. We currently use affiliate links on our site and in some of our content, and are exploring sponsored content, as well as events and premium features that would provide additional revenue down the line. Mike: I see FinishersClub.com is available for sale. Is that something you would consider to supplement your domain. Why or why not? Mike: Tell me about running an online business. Is it a lot of work? What have been the biggest challenges? David: The biggest challenge in running an online business is finding a way to keep delighting users in new and surprising ways — based both on the things that users actually request, and the features we sense they would want based on how they use our site. I mean that seriously. For instance, we noticed that users were inputting in a lot of detail about the kind of gear they were running in. Runners were spending time keying in, for example, “New Balance Vazee Pace v2.” We wanted to find a way to make that and easier to do and more visual. So we crafted an auto-complete function that necessitated re-writing our database and re-doing certain visual elements on the site. But it will now auto-complete the name of your gear as you type, and also produce the relevant image, as well as the ability to rate that given gear item. We think – and users tell us – that it’s a fantastic addition to their running lives. But ultimately, our whole team – from our CFO to our developers to our marketing team – is comprised of runners, and so delighting athletes is part of our organizational DNA. We are lucky to be able to build the best running platform of its kind for an incredibly passionate group of people. Brian Pendergraft is a Real Estate Attorney and Planlord® Attorney at tpf.legal that uses his most valuable resource, his time, on studying and practicing law to provide landlords and investors with a wide-range of services. Most real estate attorneys “specialize” in one particular area such as only being a title producer, but Brian is 6 or 7 real estate lawyers in one. He does contract drafting and review, evictions, litigation, document drafting, closings, and more. His life’s mission is to turn landlord into Planlords. Mike: Brian, the domain you chose is a dot legal name. Why did you decide to go with that over a dot com such as tpflegal.com? Brian: With .legal and other non-dot com domain extensions it is easier to get shorter domain names. I value having a shorter domain. I also own the more conventional pendergraft.net and pendergraftfirm.com, but people tend to hear and spell “Pendergrass” (like the singer Teddy Pendergrass) instead of Pendergraft. Also, .legal is something most of my potential clients have never heard of and it stands out. It has a certain “coolness” factor to it that distinguishes my modern law firm from older. more traditional ones. Mike: There is also the dot law TLD. Have you considered also securing your name TPF.law? Why did you choose dot legal over this? Brian: I did consider .law but last time I checked it cost about $400.00 a year whereas .legal is about $40 a year. So it was based on cost. Mike: Do you see other attorneys leaning towards these new TLDs as well? What are your thoughts about the future of dot legal? Brian: The adoption of .legal will be very slow. Attorneys, like the law itself, are very slow to change. In addition, many attorneys invest their knowledge and training into reading and writing and not into learning domain name registration and building websites. So many attorneys won’t know that these options exist unless whoever they pay to build there website brings it up. Also, changing domain names after you have been using one for a while has its own unique set of challenges, so attorneys that do learn about .legal will tend to stick to whatever they were using first. Mike: What strategies do you currently use to promote your site and your law business? SEO, advertising, social media? Brian: SEO, content marketing, and e-mail marketing. I do blog post and video where I share free legal information that is very relevant to my target audience of landlords and real estate investors. I share the content on Facebook, Linkedin, Twitter, and Instagram. I am currently not paying for any advertising. I want to see how far I can go by just giving away free content. It’s working well so far! To see an example of what I mean you can check out my latest piece of content on how to file for wrongful detainer in Maryland at https://tpf.legal/wrongful-detainer. I tell my audience exactly how I do it so they could actually just prepare their case themselves and not hire me. However, I’m betting that many people will watch the video or read the post and just want an attorney to handle it for them and hire me, the helpful attorney. Mike: Did you hear the one about the two lawyers on a row boat in the middle of the ocean? Just kidding. Why is it that lawyers, in general, get a bad rap? Brian: I think it’s a combination of classism (or should I say access to justice), high fees, rotten apples, television, and a lack of transparency and understanding. We have all read a few stories where rich kids were able to avoid prison for committing grievous offenses because their families had connections and were able to afford high-powered lawyers with lots of connections. Lawyer hourly billing rates are very high when put into perspective. At $300 an hour that’s one brand new Nintendo Switch an hour! Corrupt lawyers make the rest of us look bad. Kind of like how bad police officers make good police officers look bad. The general publics understanding of what we actually do, in part because of television, but admittedly it maybe moreso because of us lawyers ourselves. Being a real lawyer and running a law firm is nothing like TV. One time I had a case where the Judge decided to postpone the case to give the other side time to get an attorney. He asked me why didn’t I object. The Judge already made his decision there was nothing I could do. But on the TV shows the great lawyers can say magic super convincing words and get their clients whatever they want. In the real world in many cases we settle and compromise a lot and no one actually gets what they want. I think this lack of understanding may be more so the fault of lawyers because law firms and lawyers are very protective of their processes and what they actually do. I remember when I first tried reaching out to other attorneys as a brand new attorney and they refused to help me in the name of protecting their business when I was just trying to figure out how to lawyer at the time. So if the lawyers aren’t telling people what they do then television will. Mike: Do you think you’ll consider getting additional names to support and promote your business? Brian: Yes. I recently registered the trademark for “Planlord” a term I made up registered on the same day as my birthday, April 11th. It’s a pun on the words plan and landlord. I self-published a book on book Amazon for landlords on how to avoid the legal pitfalls that cost landlords thousands of dollars called Planlord – The Landlord Primer. Planlord.com was available so I bought it and plan on using it one day for a Planlord line of legal products. There are many new TLDs floating around out there with people and businesses registering countless domains each day. The whole concept is great, and opens up tremendous opportunities. Some names and TLDs just don’t fit well together and require a certain niche. Others, fit together like they were made for each other. Jordan Lavin is Chief Operating Officer at Mosquito.buzz, and has taken some time to talk to me about his domain and his business. Mike: Mosquito.buzz just flows off the tongue. A great name selection. Tell me about the business behind it and what service you provide. Is it a new business? Jordan: We offer mosquito control service to residential homes, cottage owners, events, business facilities and anyone who is looking to ‘stay outside’ without the annoyance, or health risks associated with mosquito bites. We opened the company in January of 2016, the first service of its kind in Canada. Our expansion plans across the country include franchise opportunities as well as corporate operations. We have had a lot of interest to be a part of the brand. Mike: What did you take into consideration when you were choosing a name for the business and domain. What factors feed into it? Jordan: We sort of ‘reverse engineered’ the business name once we found the domain we liked. We were not going to pick a business name without a solid domain to connect it to. When we saw the .buzz extension, it really worked for our brand, and our service. It’s functional and fun…and hopefully memorable. Mike: You offer a free ebook on mosquitoes. How has that helped business or to drive traffic to the site? Jordan: Our free e-book offering is simply just delivering what we know to potential customers, and people interested in learning more about how to control mosquitoes. Why not offer up your knowledge? It give us good ‘street cred’, it follows the law of ‘reciprocity’ and it gives customers, potential customers, and general visitors some further knowledge on the insect that tops the list of the world’s deadliest animals. Mosquitoes kill over 700 000 people each year and the diseases they carry are getting broader. Mosquitoes are a growing concern for people all over. Mike: .buzz is a newer TLD and not necessarily widely know by consumers. What sort of feedback have you received? Jordan: Generally great feedback. It fits well with our brand. We have ‘gone back’ to adding the www. in front of the domain on a few occasions to ensure people understand that .buzz is the whole domain. It’s a good conversation starter! Mike: Personally, I get eaten alive by mosquitoes and would love to have your service on a regular bases. I also have dogs and kids… is it safe for them? Jordan: The products we use are safe for mammals. We ask for a 30 minute grace period to let the products dry before you re-enter the treated area. Our products are very similar to the widely used for animal flea control, and many outdoorsmen, and military treat their clothing to protect against insects in the woods. Mike: I see that you wisely registered MonsquitoBuzz.com and have pointed it to your main site. 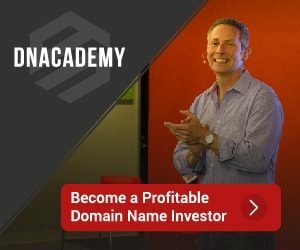 Are there other domains that you have registered? Jordan: We registered several, just to protect the brand, and anyone’s confusion about the domain. It’s just good business practice when building a solid brand. Mike: Any tips for those considering the .buzz or any other new TLD? Jordan: .com domains are tough to come by. I think that creativity add some ‘spice’ to a brand. In our case, I think that .buzz ended up more powerful that any other choice we could have made. At first, we were hesitant that people wouldn’t ‘get it’. We were wrong. They get it, the like it, it’s fun, and fun wins the consumer these days.